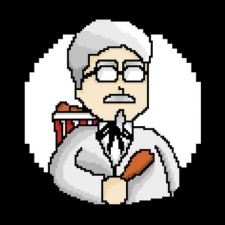 KFC is having fun with a virtual Colonel Sandcomputer-generated version of the company's mascot and founder. The social media campaign, which it teased on both Twitter and Facebook, pokes fun at traditional Instagram influencers. The company has shared images of CGI Sanders to Instagram. Images include a tattoo saying “secret recipe for success” alongside photo descriptions that read: “always try to inspire like I do when I’m making amazing fried chicken”. 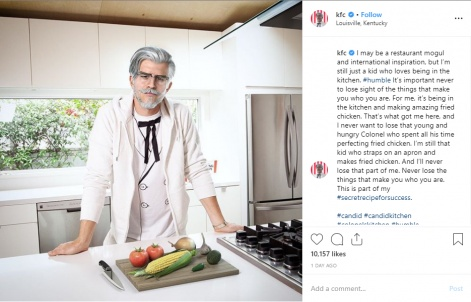 KFC even went as far as to give the influencer Colonel a look that is similar to some Hollywood actors and plans on promoting partnerships with brands like Old Spice and Turbo Tax, as well as Dr. Pepper. Virtual influencers have risen in popularity in the last year. The trend was spearheaded by virtual Instagram starlet Lil Miquela. In a questionnaire from Ad Age given to the team behind the campaign, the responses from the team were in character for the influencer Colonel Sanders. "I make a good living crushing deals as a virtual influencer, but let’s just say, fried chicken still pays the bills," Influencer Sanders tells Ad Age. This isn't KFC's first foray into the influencer space. Last year, the company also launched a new gaming brand, which saw it send out vouchers for free chicken to a number of gaming influencers.